Researchers at Saarland University have created an ultrathin flexible film that can act as a sensor for innovative technologies. Integrated within a glove, the new sensory film can communicate the current position of the wearer's hand and fingers. By establishing a direct connection between the virtual and real working worlds, man and machine can, quite literally, work hand in hand. The research team led by Professor Stefan Seelecke has achieved this through the use of smart silicone films. Another goal of the research work is to assist the wearer of the glove by transmitting tactile signals such as pulses or vibrations that are produced by the polymer film. The team of engineers will be at Hannover Messe from the 1st to the 5th of April at the Saarland Research and Innovation Stand (Hall 2, Stand B46), where they will be showcasing the prototype glove and looking for partners with whom they can develop the technology for practical applications. An assembly operator discovers that they have used the wrong component and so they now have to take apart everything that they had previously assembled. This takes time and results in production delays. If only the computer had been able to flag up the error while the operator was taking the component from the storage bin. But the computer was completely unaware of the mistake. Now, thanks to a smart glove developed by a team of engineers led by Stefan Seelecke at Saarland University, this information can be made available to the computer system. In combination with smart glasses, the glove can provide personalized assistance to assembly line workers or service technicians whose job it is to assemble or repair complex devices or systems—thus avoiding potentially costly mistakes. The researchers have taken an ultra lightweight, highly flexible film made from an elastic polymer and have turned it into an adaptable sensory organ for a variety of technical applications. By lining a glove with the polymer film, they can create a man-machine interface without the need for heavy sensors or cameras—it's all done with an ultrathin plastic film that is not felt by the wearer and that does not restrict them when carrying out their work. 'The film we use is known as a dielectric elastomer. 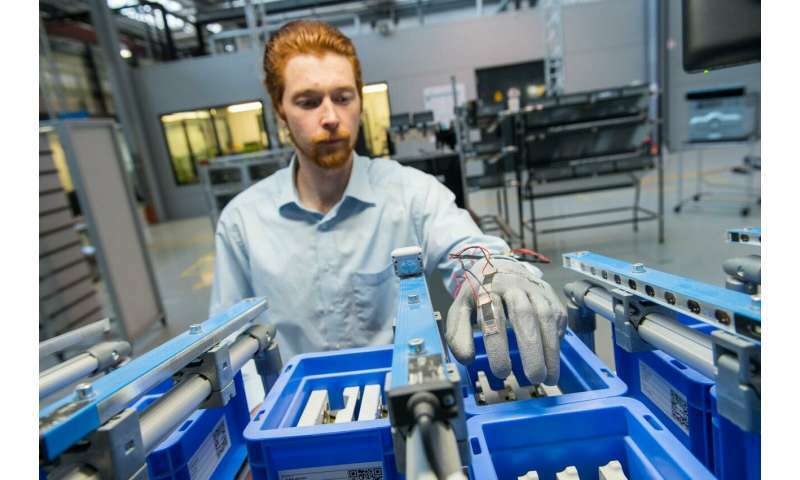 And the glove essentially functions as a flexible sensor,' explains Professor Stefan Seelecke, who heads research teams at the Intelligent Material Systems Lab at Saarland University and at ZeMA (Center for Mechatronics and Automation Technology) in Saarbrücken. An electrically conducting material is printed onto both sides of the silicone film. When a voltage is applied to the film, the resulting electrostatic attractive forces cause the film to compress, extending the film laterally and thus increasing its surface area, which in turn alters the electrical capacitance of the film. This property effectively transforms the film into a sensor. 'We can assign a precise electrical capacitance value to any particular position of the film,' explains Steffen Hau, a Ph.D. engineer working in Seelecke's team. The engineers therefore know at any moment just how a finger is stretching, pulling or compressing the film. Using algorithms, the team is able to compute these motion sequences in a control unit and then process the results with a computer. For the next stage of the development process, the researchers want to enable the glove to communicate directly with the wearer, by means of tactile signals, such as pulses or vibrations, that would be sensed by the wearer's fingers. 'The computer could then send, for instance, a pulsed signal to the operator's fingertips to tell them "You've taken the wrong component", or a vibrating signal to confirm "That is the right component",' explains Steffen Hau. The thin silicone film is not just a sensor, it can also be made to pulse or vibrate on demand or to take up any required shape. The researchers can precisely control their silicone film and can continuously vary the frequency of its motion as required, from high-frequency vibrations down to a slow pulsing or flexing motion. This highly responsive film could in future be used to prevent assembly operators or technicians picking the wrong component from sorting bins.